Posted in: Inspiration, Writing Exercises. 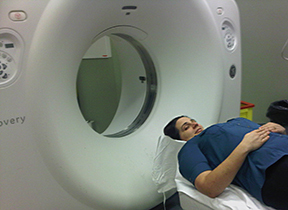 Tagged: ct scan. Why is that important to writing? Inspiration of course. While the machine throbbed and clicked I realized that medical equipment is neat. It makes interesting noises I don’t understand and it produces interesting results I don’t understand. Every time I see something I don’t fully understand I am inspired to fill in those holes in my knowledge with something from my imagination. Not knowing something is an invitation to invent the knowledge. I once heard C.C. Humphreys say that he looks for the holes in a story; the piece of history that is missing, the question no one can answer, and then dives into the holes because in those spaces an author can create. This is a paraphrase of course but the idea, if not the exact words, stuck with me. Medical equipment is something of which I know very little. I know I go in and results come out. Everything else is a great big hole in my knowledge to play in. Have you ever been in a hospital or specialist’s office and seen a piece of equipment that you just couldn’t figure out? Small or large medical equipment makes me wonder. Why do the lights flash? If x-rays are everywhere in the room when the machine turns on (the technician leaves) why would covering just the top of my abdomen with a lead blanket provide protection? Choose a piece of medical equipment that you do not understand. In my case the CT machine. Now ask yourself, if the inside of the machine were not made of wires and tubes that a mechanical engineer could explain, what would be inside? Is it the same magic blue smoke that allows my computer to function? Is it a creature that lives in the machine and performs a task? What could be there and why? Of if you prefer, consider what else the machine might be capable of. Consider that the machine could have been planted in the hospital by a mad scientist bent on…well something mad, or an alien race with an agenda. Sure it outputs the test the doctors are looking for, but what else could it be doing to advance the needs of the person who planted the device. If you are used to writing science fiction or something else with a great deal of research, resist the urge to consult sources. This exercise is about playing in a space that you don’t understand and allowing that lack of knowledge to stimulate your imagination. Aim to write two pages about your mystery machine.